Are Ravens Responsible for Wolf Packs? Ned Rozell | Geophysical Institute Mar 17, 2017. A raven in Fairbanks. photo by Ned Rozell. People who study animal behavior think they may have found out why wolves hunt in packs — because ravens are such good scavengers. Scientists who watched wolves on Isle Royale in Lake Superior came up with the raven-wolf pack theory after puzzling over a question: Why do wolves hunt in large groups when a single wolf can take down a moose? To find a possible answer, John Vucetich and Rolf Peterson of Michigan Tech and Thomas Waite of Ohio State University examined 27 years of wolf observations on Isle Royale in northern Michigan. Isle Royale, 45 miles long and up to nine miles wide, sits in the northwest lobe of Lake Superior. A national park, the island supports a population of a few dozen wolves and hundreds of moose. Peterson studied the wolves for more than 30 years, and the researchers used observations from Peterson and his coworkers in the present study. A 1,000-pound moose is much more than two wolves can eat right away, and that’s where the ravens come in. 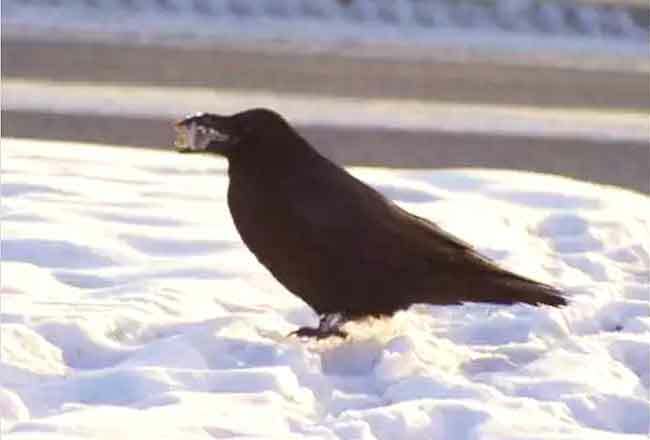 In a study published in Animal Behaviour, the scientists detailed these facts about ravens found by other scientists: individual ravens can eat and carry away up to 4 pounds of food per day from a large carcass. Ravens were responsible for moving half of a 660-pound moose carcass from a kill site in the Yukon Territory.During the 27 years of Peterson’s wolf observations used in the recent study, ravens were present at every wolf kill, often within 60 seconds of a moose’s death. Noted raven researcher Bernd Heinrich has suggested that ravens evolved with wolves, with ravens possibly leading wolves to moose or caribou, and then later feeding upon the carcasses torn open by wolves. Ravens sneak in to eat or carry away scraps of moose flesh and organs while wolves are feeding or resting away from the carcass, and the more ravens there are (researchers have counted up to 100 near kill sites), the harder it is for wolves to chase them off. The urge not to die by starvation may drive wolves to kill “approximately twice as many large prey as would be needed in the absence of ravens,” the scientists wrote. They also wrote that 85 to 90 percent of carnivore species hunt alone, and the wolf pack might not exist if not for the pesky, bold raven.